It’s the little things that you have to look out for when you’re doing a big project. When you get your spool of Cat6 cable and your bags of connectors, prep a cable end and prepare to terminate it with a connector, you expect to finish the job easily, right? But then you find that the cable outer jacket doesn’t fit in the connector, and you can’t crimp it. Or the conductors are too big, packing in too tightly on the way to the contact punch-downs. You know this isn’t right, but you didn’t do anything wrong – did you? Cat6 cable, Cat6 connectors. It should be simple. But cable changes are making it hard to terminate with existing Cat6 RJ45 connectors. It’s a common problem, and the reason is simple. Cat6 cable can vary and is built to meet performance standards. It can have thicker insulation, larger conductors, tighter twisted pairs and a variety of shielding and grounding arrangements. No wonder the connectors don’t simply fit! If you want to do it right and certify your installation, there’s a better way. The Platinum Tools ezEX-RJ45™ Connectors simplify connector termination and also adapts to a wider variety of outer diameters, insulation sizes, and conductor diameters. This new ezEX-RJ45™ Connectors are the easiest RJ45 connector to terminate larger cables in the industry. The system includes a tool which works with lefties and righties, and other well-thought-out features and accessories. After all, when you start terminating cables, you don’t want to stop, take a look, and guess whether each one is “good enough.” You want to know that you did a top-notch job. Lots of experience in the business gives Platinum Tools the knowledge for what you need, and good design is what makes the tool and connector system a keeper. What’s In Your Connector Bins? 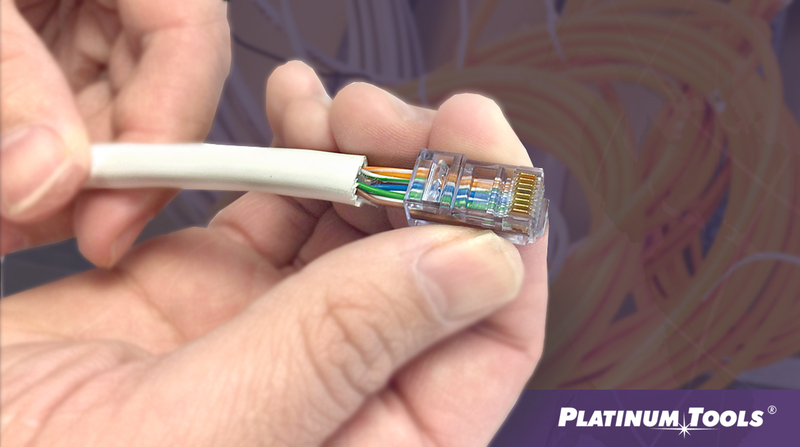 Platinum Tools reworked the trusty RJ45 in clever ways to make room for growing cable outer diameters and insulation (conductor) diameters. We also engineered two versions of the connector to provide the right size for your specific cable parameters. It’s time to take the generic connectors out of your bins, and set up to meet the advanced specs of the new cable you’re using. The connectors work with a one-shot tool system (EXO™ Crimp Frame) that is like a cable factory – it holds the connector and wires in place and crimps, chops, and is done. If you’re currently looking for the correct connector for the cable you’re installing we have a great new tool for this: Platinum Tools Connector Selector Guide will ask you a few questions (Cable Jacket OD, Insulated Conductor OD, Shielded or Unshielded, Solid or Stranded) on the cable terminating and then displays the connectors that will fit your cable. This new tool will make selecting connectors much easier. Try it today!